Raven recruits Wick to help disable the Mount Weather acid fog. Meanwhile, a disagreement between Lexa and Clarke leads to an emotional revelation. See it all for yourself when you watch The 100 online. Wick: I'll have you know, I was a god at fluid dynamics. Raven: You think you're a god at everything. Wick: Empirical evidence doesn't lie. Permalink: Empirical evidence doesn't lie. Permalink: You say having feelings makes me weak, but you're weak for hiding from them. I flew down from space. I defied death. It was all for a reason, it has to be. Permalink: I flew down from space. I defied death. It was all for a reason, it has to be. Permalink: Maybe life should be about more than just surviving. Jaha and Murphy are still traveling through the Dead Zone in hopes of reaching the City of Light. They hit a snag in the form of a mine field, which results in casualties, fear and a loss of morale. Lexa and Clarke disagree about the best way to lead. Lexa tells Clarke that she reminds her of a younger version of herself. One of the most difficult parts of being a leader is making the hard calls and asking people to fight and die for you. Raven has enlisted Wick to help her with the acid fog dilemma. They are able to communicate with Bellamy inside Mount Weather, but when Bellamy's cover is blown, the plan hits a setback. Octavia realizes that Clarke knew about the missile strike before it happened. After confronting Clarke about her actions, Lexa sends Octavia to guard duty. When Clarke becomes aware that this was a plan to have Octavia killed, she gives Lexa an ultimatum. If Octavia dies, their part in the missile strike will be exposed. Lexa tells Clarke that she trusts her and they share a kiss. Clarke tells her that she isn't ready to get involved with anyone. With help from Maya's father, Bellamy is able to get to the control room where the acid fog originates. They are able to neutralize the pH and the threat posed by the fog along with it. 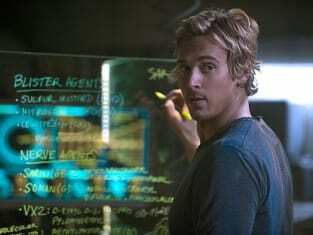 When Cage intercepts their communications, he is able to reactivate the fog. Bellamy is forced to take extreme measures, blowing up the tanks and barely escaping in time. With the fog disabled, the war is beginning. Raven uses the opportunity to hook up with Wick. Finally reaching the City of Light, Jaha and Murphy are disappointed that there is nothing there but solar panels reflecting light. However, a drone appearing makes it clear that there is more going on than meets the eye.